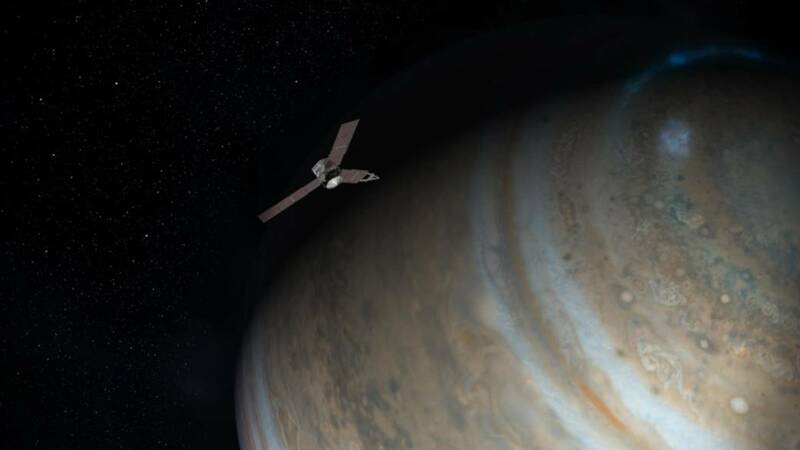 The Juno satellite which left Earth five years ago was launched on a mission to study Jupiter’s composition and evolution. The Juno Satellite had to fire a rocket engine to sling itself into Jupiter’s orbit. Juno will spend the next three months getting into position to begin studying what lies beneath Jupiter’s thick clouds and mapping the planet’s gargantuan magnetic fields. Flying in egg-shaped orbits, each one lasting 14 days, Juno also will look for evidence that Jupiter has a dense inner core and measure how much water is in the atmosphere. . Scientists plan to use the spacecraft to sense the planet's deep interior. They think the structure and the chemistry of its insides hold clues to how this giant world formed some four-and-a-half-billion years ago. Launched from Florida nearly five years ago, Juno needed to be precisely positioned, ignite its main engine at exactly the right time and keep it firing for 35 minutes to become the second spacecraft to orbit Jupiter. NASA expects Juno to be in position for its first close-up images of Jupiter on Aug. 27, the same day its instruments are turned on for a test run. The probe will also try to settle old arguments over whether the planet hosts a solid core or whether its gases go all the way down to the center in an ever more compressed state. And it will look for the deep swirling sea of liquid metallic hydrogen that theory suggests is the cause behind Jupiter's immense magnetic field. No previous spacecraft has dared pass so close to Jupiter, its intense radiation belts can destroy unprotected electronics. Welcome to Jupiter!" flashed on screens at mission control at NASA's Jet Propulsion Lab in Pasadena, California. The Juno team cheered and hugged. "This is phenomenal," said Geoff Yoder, acting administrator for NASA's Science Mission Directorate. 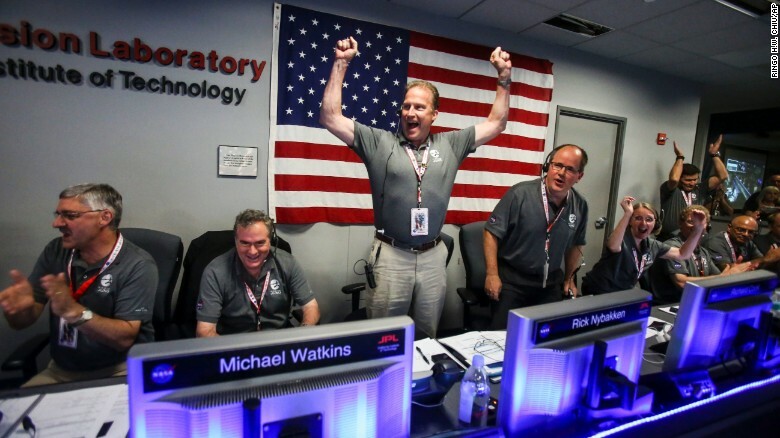 "NASA did it again, we're there, we're in orbit. We conquered Jupiter." said Scott Bolton, Juno’s principal investigator.